As the installed capacity of solar grows by gigawatts every month, so too has the importance of asset management and operations and maintenance (O&M) services. With the addition of energy storage to the equation, the global services sector faces even more challenges—and opportunities—to optimize power plant performance for asset owners while reducing their costs. 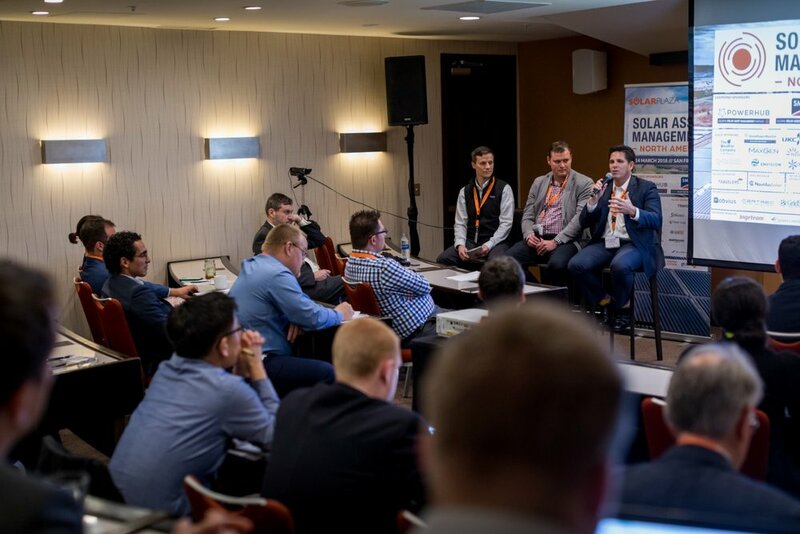 The Solar Asset Management North America (SAMNA) conference, produced by Solarplaza, has also grown in stature, with attendance reaching 500 at this year’s recent event in San Francisco. NEXTracker supported the conference as a sponsor, and I had the pleasure of attending SAMNA with members of my team and participating on an advanced data analytics panel. In fact, one of the main takeaways from SAMNA was the rapidly evolving use of machine learning and other data harvesting, analysis and control tools in the solar and storage asset management space. Whether the focus of the presentation was on financial, technical or operational aspects, the need for improved digitalization and automation of services was a recurring theme. Pictured here from left to right are Cedric Brehaut (Solichamba/moderator), Marty Rogers (NEXTracker), Vania Mesrob (Coronal Energy), and Frank Lebreton (QOS Energy). Cedric Brehaut, who runs the SoliChamba consultancy and knows as much as anyone about this space, talked about digitalization and its cost-reduction impact on solar asset management and O&M during his plenary session presentation. He pointed to four areas that are changing the way our business is done: big data analytics and artificial intelligence, blockchain, robotics and drones, and connected devices and the Internet of Things (IoT). During my panel (which Cedric moderated), the discussion centered on that first category, specifically the diagnostic use of machine learning and pattern matching and recognition. Franck Lebreton of QOS Energy presented an informative explanation of how his company harnesses the power of data and uses machine learning to better predict power generation. It all starts with making sure one’s data has been “cleansed” and has the quality on which to build the powerful algorithms that make predictive modeling and accurate production forecasting possible. As I explained during my remarks, NEXTracker collects and analyzes a huge amount of quality data from our fleet. With 450,000 trackers deployed and 13.5 million sensors collecting many gigabytes every day, we have a global dataset that we analyze to improve the performance of our systems—and our customers’ plants—as well as predict and prevent possible issues before they become problems. I shared a case study where we put this predictive pattern matching and root-cause analysis firepower to work, nipped a potential issue in the bud, and upgraded our product design. It’s one of my mantras: we want to take care of our customers’ needs before they have a need. Another topic that seemed to be on everyone’s mind at SAMNA was energy storage asset management and O&M. This young asset class is growing rapidly. The latest GTM Research data shows the U.S. storage market topped the gigawatt-hour installed capacity mark in 2017 and should double that in 2018. With all these new and retrofitted stand-alone battery and solar-plus-storage systems coming online, the need for smart, integrated services offerings becomes critical. Although there are overlapping focus areas for solar and storage services, there are also significant differences in the management and coordination of the maintenance and optimization of the systems. Pictured here is Anthony Conklin (Solar-Log), Leigh Zanone (8minuteenergy), and Patrick Leslie (GridTech). Leigh Zanone of 8minutenergy noted during a panel on first lessons in storage O&M and asset management that how solar performs and is used is fairly clear-cut, but there are many potential use cases for storage that must be managed. The system could be used for load shifting, frequency regulation, self-consumption, auxiliary utility services, long duration, and resiliency (or a combination), and the application impacts the degradation rates and ultimate lifetime of the batteries—and how they need to be operated and maintained. Leigh also explained that the level of data granularity needed for storage is greater than that for solar because there are more variables to control. As several panelists pointed out, it’s still early days for storage services, and the best practices, scope of work, warranty issues, and other parameters have not been standardized. Storage technology and equipment are works in progress, but the upside potential of the intelligent pairing of solar and storage—what some have called the “peanut butter and jelly sandwich” clean energy combination—is limitless. As NEXTracker deploys more of its NX Flow and NX Drive storage solutions, my team is bringing our customer-centric approach and big data analytics tools to bear on getting the best out of the systems. NEXTracker Global Asset Management Team: Arti Gopinath, Deb Ghosh, and Marty Rogers. If you are interested in learning more about what was discussed at SAMNA this year, stay tuned, as videos of the sessions and recaps of the event will be released in the coming weeks. To learn more about NX Global Services and NX SCADA (Data Monitoring and Control Platform), click here and here.